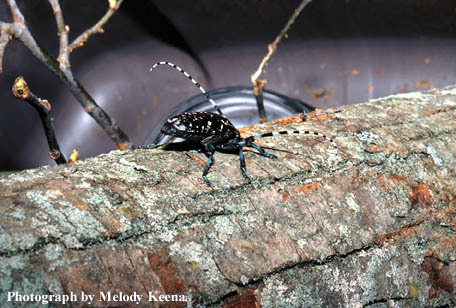 There is a critical need for information on the basic biology of the Asian longhorned beetle, Anoplophora glabripennis (Motschulsky), to provide the biological basis for predicting developmental phenology in order to optimize the timing of exclusion and eradication treatments and to predict attack rates under different environmental conditions. In these studies, we used individuals from Bayside, NY and Ravenswood, IL to assess temperature effects on developmental rates and survival at 10°C (larvae only), 15°C, 20°C, 25°C, 30°C (egg and larvae only) and 35°C (larvae only). There were no significant differences in female longevity between populations or temperatures. Males tended to lived longer than females at all temperatures and lived longer at 20°C than 15°C or 25°C. The time the females began laying eggs and the order of average number of eggs laid was significant: 25°C > 20°C > 15°C. Bayside females laid fewer eggs at both 20°C and 25°C than Chicago females. The order of mating success, as measured by the percentage of females that laid eggs that hatched, was: 25°C > 20°C > 15°C for both strains. The percentage of eggs that were viable did not vary between temperatures or strains, but the percentage that hatched at 15°C was significantly less than at the other temperatures. Some of the eggs laid at 15°C did not hatch until moved to 25°C. A nearly linear relationship existed between developmental rate of eggs and temperatures between 15°C and 30°C. Using this relationship, we would predict that eggs would not hatch at temperatures of 10°C or less. Based on the lower percentage hatch of viable eggs at 30°C compared to 25°C, the upper temperature at which egg development ceases and eggs die is at or above 35°C. The minimum developmental threshold for instars 1 to 8 is projected to be close to 10°C. There is some development at 10°C, at least for early instars; about 20 percent of the larvae will molt to the second instar after about 5 months. The upper threshold for larval development, the temperature at which development stops and death occurs, is probably between 35 and 40°C. Larval survival was higher at 25°C than at lower temperatures and was zero for 35°C by the beginning of the fifth instar. Larvae held at 15°C, 30°C, and 35°C had narrower head capsules and weighed less than those held at 20°C or 25°C from the third instar. This might indicate that these temperatures are less than optimal for growth. The Chicago larvae gained weight faster than those from Bayside in the later instars. The Asian longhorned beetle, Anoplophora glabripennis (Motschulsky), was recently introduced to the United States and has the potential to destroy many urban and forest trees. A successful artificial diet and rearing protocol are urgently needed, because research with this wood-boring beetle can only be conducted in the confined areas of quarantines. We compared larval growth and adult parameters using three artificial diets, one developed in China for A. glabripennis and two developed for other members of the Lamiini. The only difference in performance of larvae and adults reared on the three diet types was that non-diapausing larvae reared on Monochamus carolinensis (Olivier) diet needed less time to pupate than non-diapausing larvae on A. glabripennis diet. We further evaluated substituting the phloem-cambium of sugar maple, Acer saccharum Marshall, with sawdust or cellulose. Males grew fastest on diets with sawdust or phloem-cambium and remained as pupae for the shortest period of time on A. glabripennis diet. Females grew faster on diets with cellulose than sawdust and lived longest on A. glabripennis diet. The published A. glabripennis artificial diet, modified by increasing the water content from 50.0 to 64.6% (w/w) and substituting the phloem-cambium component with cellulose, was the optimal diet tested. A rearing protocol used to maintain our colony is included. Infestations of the Asian longhorned beetle Anoplophora glabripennis (Motschulsky) were first detected in the United States in the New York City area in August 1996 (Cavey et al. 1998, Haack et al. 1996) and subsequently in the Chicago area in July 1998 (Poland et al. 1998). Although chemical and biological control options are being investigated, eradication by means of removing infested trees and chipping the wood is still the principal control option (Haugen 2000). As a result, living A. glabripennis are difficult to obtain in the United States, and researchers needing to study these beetles are forced to work in the confined space of quarantine facilities. Additionally, the natural life cycle of A. glabripennis in the United States is believed to last at least a year (Haack et al. 1996), as some individuals require a chill period to satisfy diapause requirements (Zhao et al. 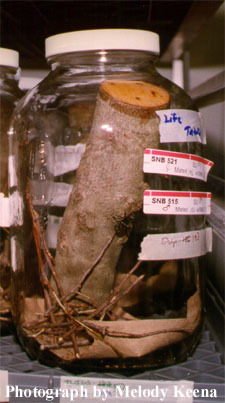 1998), making it difficult for the researcher to rapidly obtain large numbers of specimens for experimental purposes. Therefore, a successful artificial diet and rearing protocol are needed to produce healthy larvae in as short an amount of time as possible. Due to increased global trade, the USA is coming under increasing threat of invasion by other closely related, and economically damaging, Cerambycidae. 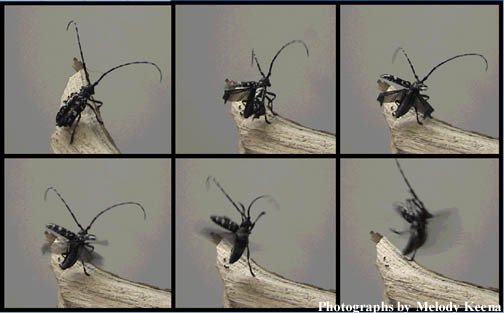 Several of these are members of the genus Anoplophora, such as the white-spotted longhorned beetle Anoplophora malasiaca Thomson, a serious pest of citrus (Citrus spp. ), pear (Pyrus spp.) and apple (Malus spp.) and numerous other trees in Japan, China and Malaysia (Adachi 1994) and Anoplophora chinensis (Forster), a serious orchard pest in China (Wang et al. 1996). The information presented here could thus save valuable time and resources if Cerambycidae closely related to A. glabripennis, such as these two other species, were to invade the United States. This diet and rearing protocol could also be used as a starting point to develop diets for other Cerambycidae. There is a critical need for information on the basic biology of Anoplophora glabripennis (Motschulsky), a recently introduced nonnative invasive species. With this information one can predict the timing of biological events that are fundamental to the development and improvement of exclusion and eradication methodologies. 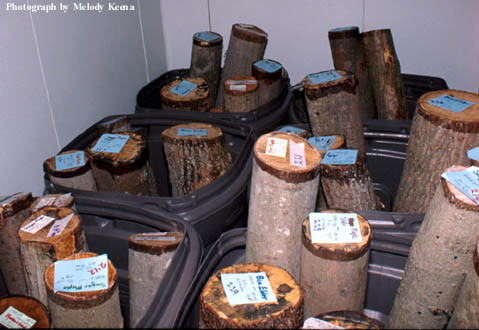 The results of a life-table study and analysis of infested logs are presented here. Eggs used in the life table study were obtained from 30 mating pairs each from the Ravenswood, Chicago, IL (RC) and Bayside, New York, NY (BN) strains. Acer saccharum logs (3-7 cm diam, 20 cm long) were provided for oviposition; twigs were provided for food. Time in each stage and instar was determined for 200 individuals from each strain at 25°C and 60% RH. Larvae were reared on red oak borer diet, observed daily for molting and weighed every other week. When 84 days old, half of the larvae were chilled (5°C) for 91 days; the other half were not chilled. Eggs of A. glabripennis hatched in 15 days; the newly hatched RC larvae weighed 4.3 mg and BN larvae 3.9 mg. After 84 days, the RC larvae weighed 1.8 g and the BN larvae weighed 1.5 g. The average instar of both the RC and BN larvae was 7 after 84 days. From the fourth week on, RC larvae were significantly heavier than BN larvae. Larvae of both strains spent progressively longer time in each instar up to the seventh instar. As many as 12 instars were observed for unchilled, normal-size larvae and one smaller larva went through 14 instars. 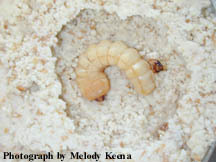 The heaviest unchilled larva was an RC that weighed 3.3 g. The earliest pupation occurred after 97 days when the larva was in the sixth instar. Females spent an average of 18 days as a pupa verses 17 for males. Mortality is < 20% and 40-50% of the mortality occurred in the first instar. In February 1999, 181 Acer platanoides, 132 A. saccharinum, and 11 Fraxinus sp. logs infested with A. glabripennis cut in Ravenswood, Chicago, IL were brought into quarantine. The logs, which averaged 66 cm in length and 10 cm in diam, were held at 23°C and 40% RH. Adult emergence began on May 11 and peaked June 7-14. The sexes emerged nearly synchronously. Adult females were significantly heavier (0.7 g) than males (0.5 g). In general, adult weight decreased with number of weeks to emergence, probably due to log desiccation. Larger adults tended to eclose from larger diameter logs. Acer platanoides logs had more oviposition pits and significantly more exit holes than A. saccharinum logs. The number of oviposition pits and exit holes increased with log diameter (to 15 cm) and then declined. On A. platanoides logs, 31% of the oviposition pits resulted in an exit hole compared to only 14% on A. saccharinum logs and 19% on Fraxinus logs. There were new exit holes on 40% of the A. saccharinum and 46% on of the Fraxinus logs compared to 77% of the A. platanoides. Forty-six percent of all the logs had old exit holes and 13% of these showed signs of wound repair. This result indicates that the logs had been used by successive generations of the beetle. Fosbroke, Sandra L. C.: Gottschalk, Kurt W., eds. 2000. proceedings, U.S. Department of Agriculture interagency research forum on gypsy moth and other invasive species 2000; 2000 January 18-21; Annapolis, MD. Gen. Tech. Rep. NE-273. Newtown Square, PA; U. S. Department of Agriculture, Forest Service, Northeastern Research Station. pp.22-23. Anoplophora glabripennis (Motschulsky) (Coleoptera: Cerambycidae) is one of the more recently introduced non-native invasive species to become a pest in the United States. Current surveys in urban areas are estimated to be only 30% successful because of uncertainty about characteristics of A. glabripennis dispersal and capacity to spread. The studies described here document the proportion of the population that initiates flight under laboratory conditions, and the life history and host quality factors that lead to flight initiation (including age, feeding and mating status, and host moisture content). Adults that were flight-tested came from laboratory strains or infested wood obtained from either the Chicago, Illinois or the Queens, New York infestations. Thirty-two males and 30 females were flight tested on Acer saccharum logs dried for 3+ weeks, and 18 females and 14 males on fresh cut A. saccharum logs. Each individual was flight tested at four separate times during the adult stage (always on the same log type): 1) at emergence, never fed, and unmated; 2) one week after emergence, unmated, and fed; 3) one day after mating and fed; and 4) three weeks after mating and fed. Each bioassay consisted of 1-4 adults on separate logs that were observed for a period of 45 minutes. Adults initiated flight more slowly at lower than at higher % RH. Males tended to fly more than females during the 45 min. observation period. A significantly higher percentage of females flew from dry logs than from fresh logs at all stages. Females chewed significantly more pits on fresh than on dry logs and of females that chewed a pit only 16% flew. Newly emerged and newly mated females were more likely to fly from fresh logs than one-week-old virgins or females mated for three weeks. Newly emerged males were more likely to fly from fresh logs than males at any of the other stages. When disturbed, a higher percentage of both male and female beetles flew a longer distance than when they were allowed to initiate flight on their own and this was most pronounced in the fresh log group. The results suggest that about half of the newly emerged adults of both sexes will fly from a log that has no twigs attached, probably in search of food. Almost all beetles walked up and/or down on the log before initiating flight so on living trees fewer may have flown because they would encounter twigs to feed on. Well-fed females appeared to stay on a host of good quality and chew oviposition pits rather than fly. When the host quality is poor >50% of females flew within the first 30 minutes and additional females would likely have flown after chewing pits and assessing host quality. Because > 85% of all males flew in this study, males would be expected to fly at some stage in their life regardless of host quality. Males were more likely to stay on a log than fly when they have recently mated a female. Therefore, when populations are small and host trees are fresher more males may fly in search of females while females would likely fly less than at higher population densities on deteriorating well colonized hosts. January 16-19, 2001 in Annapolis, MD. At Penn State, a hierarchical list of preferred and non-preferred host tree species for Asian longhorned beetle (Anoplophora glabripennis Motsch.) is being developed using living trees grown in a quarantine greenhouse. The goal is to evaluate oviposition preference and larval performance among tree species commonly planted in the urban landscape. Because only larvae were available for research at Penn State last year, a method to evaluate larval survival under greenhouse conditions was developed by artificial insertion of first instar larvae into sugar maple (Acer saccharum), green ash (Fraxinus pennsylvanica), and red oak (Quercus rubra). Percent survival was determined at days 15 and 60. At day 15, mortality was 12.5% across all species. At day 60, survival in sugar maple was 84.6%, green ash 30.8%, and red oak 62.5%. 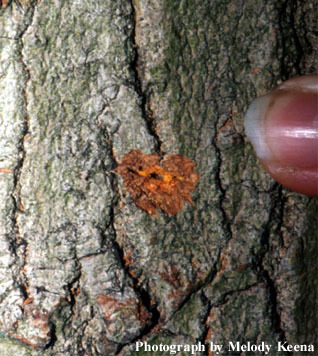 The higher above the soil line larvae were inserted into the tree, the greater the survival, especially in green ash. Results suggested that insertion of ALB larvae can be a useful method for evaluating larval survival. If ALB females do not oviposit on a given tree species in choice or no choice experiments, larval insertion can be done to determine if larvae can even complete development in that host species. Anoplophora glabripennis (Motschulsky) is one of the more recently introduced nonnative invasive species that has caused environmental and economic damage in the United States. Its primary host trees include species of maple (Acer), poplar (Populus), and willow (Salix). There is a critical need for information on the basic biology of A. glabripennis; information on fecundity is especially important to understand the population dynamics and predict population growth of A. glabripennis. Adults used in these studies emerged from infested logs obtained from Chicago, IL in February 1999. Sixty mating pairs were used to assess weekly fecundity, viability, and female longevity. Twenty additional mating pairs were used to assess daily fecundity over the first 5 weeks of oviposition. Freshly cut Acersaccharum logs (3-7 cm diam, 20 cm long) with waxed ends were provided weekly for oviposition. Anoplophora glabripennis lays more eggs and survives longer in the laboratory on Acer saccharum than is generally reported. Females laid an average of 68 eggs over the 73 days that they lived; 89% hatched. The female with the highest fecundity (161 eggs) lived 106 days; 158 of her eggs hatched. This implies that under favorable conditions (optimal hosts and few mortality factors), the beetle population could increase fairly rapidly. The average prefeeding weight of the females was 0.8 g (range: 0.4 to 1.6 g). Female weight did not significantly affect longevity or fecundity, probably because eggs mature in the female a few at a time over her entire lifetime. Fecundity was positively correlated with longevity. The implication of these findings for control programs is that the sooner adults can be killed or removed, the fewer eggs will have been laid. Anoplophora glabripennis (Motschulsky) (Coleoptera: Cerambycidae) was first discovered in 1996 in the New York City metropolitan area and has since been found in the Chicago, Illinois, metropolitan area. In China, it is considered a major pest of maple (Acer), poplar (Populus), and willow (Salix). There is a critical need for information on the basic biology of A. glabripennis to predict the timing of biological events fundamental to the improvement of exclusion and eradication methodologies. This study reports on the attack rate and relative developmental rate of A. glabripennis on four species of Acer: saccharum (sugar), rubrum (red), saccharinum (silver) and negundo (boxelder). Freshly cut logs (10-15 cm diameter and 90 cm long) with both ends waxed, were exposed for one week to a single mating pair of A. glabripennis, from a strain established from the Queens, New York infestation. At 14, 28, 56, 84, and 112 days, three logs of each of the tree species were stripped and split to assess the larvae and eggs present on the log. The number of eggs laid per log in one week was significantly lower on red maple than on the other three maple species. Significantly more oviposition pits were chewed on the box elder and sugar maple logs than on the red or silver maple logs. The female beetles did not oviposit in all pits that were chewed and the number of sites without eggs varied between tree species. The differences in attack rate and oviposition may be due both to log moisture levels and sap sugar content since these beetles have been shown to prefer trees with higher sugar content. Survival of A. glabripennis was significantly higher and development faster on the two softer wood species, box elder and red maple, than on the harder wood species, silver and sugar maple. Survival significantly declined with log age and larval weight within each instar was reduced in the 112-day logs. 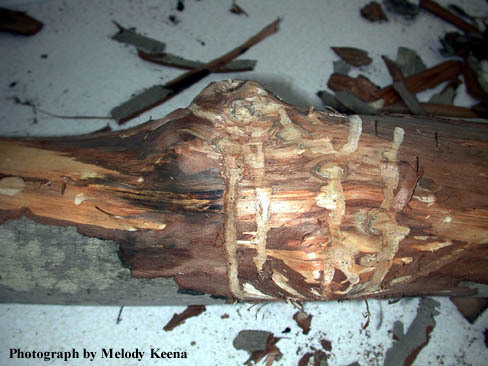 Three fifth instar larvae on 56-day box elder were the only larvae to enter the heartwood of the logs. These larval development results are consistent with our observations for cut infested wood and suggest that the beetle larvae are more likely to survive and develop from egg to adult in cut logs of softer wood maples than harder wood maples. This is particularly important since the softer wood maples are more likely to be used for firewood or packing materials such as crates.